1.Every time when you log in to the Mainconsole, an error message "the minimum resolution has to be greater than 1024x768" will pop up, even if your resolution has been adjust to be greater than 1024x768. 2.You will see this window "System encountered a problem and needed close." about notice of the dump files pops up, when you just start up Live view on Mainconsole. 1. Windows OS display resolution has been set to be lower than 1024x768. 2. Windows OS cannot set the correct resolution in Mainconsole. 1. 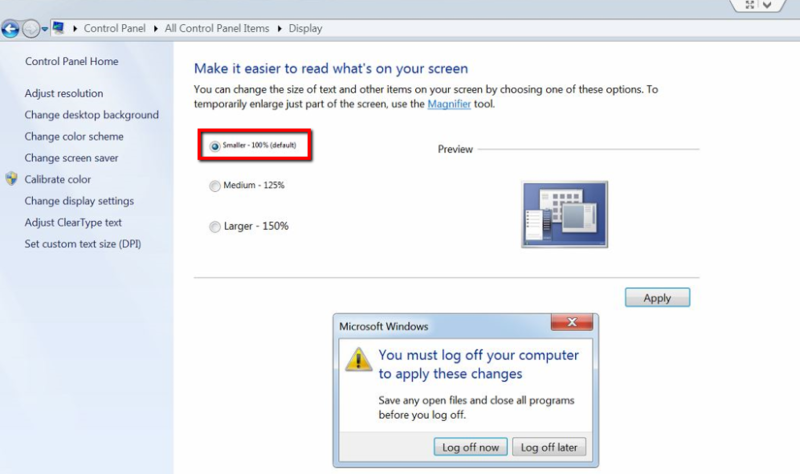 Make sure Windows OS display resolution has been set up bigger than 1024x768. 2. Check whether the display size has been set to default (100%).